Described by the Guardian as a "four-piece jerky-pop-rock band", Official Secrets Act have been making waves around the country as they bring their witty and eccentric tunes to the masses. Hello Official Secrets Act. Who are you and what are you upto at the moment? We are back in London for the first time in a while. We played Koko supporting The Rakes last night and then we had a bit of a party that ended in various corners of Camden. Now I'm sitting in a cafe in East London answering your questions. This is quite strange for me cause i'm normally a bit of a West London boy, and OSA are leading the South is the new North campaign by making Stockwell/Tooting our headquarters. What do you reckon you sound like? Where are you from originally, and what does London do better? What London location has been the most significant in the lifetime of Official Secrets Act? Scar rehearesal studios under the railway arches in Camden was pretty special. It was a hard mistress to us that forced us to play super good and stay discplined to our craft. We got signed in Tommy Flynns on a crazy Saturday night during the Camden Crawl when song was in the air, and just off Picadilly Circus you can find the telephone booth that David Bowie is standing in on the back of Ziggy Stadust and the Spiders from Mars, that's pretty cool. And for something a bit different, the view from Richmond Hill is as good a place as any to plan the new British Escapism that we dream of. What's your favourite London venue and why? 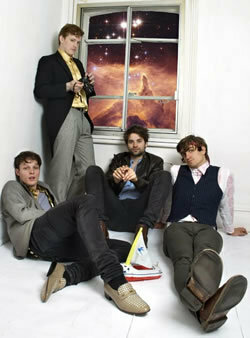 I think we'd all have our own seperate answers, but we'd all agree that we miss the Astoria very much. Can you think of a cool London location that would be amazing to do a gig at? OSA officially volunteer to be the new art installation in the Turbine Hall at the Tate Modern. We'll be like the Beatles in Hamburg meets Volta era Bjork. Beautiful colourful outfits, and 8 gigs a day. That is how OSA do things. What about somewhere a bit more grubby - have you ever busked? Mike came up to Edinburgh to see us play a squat party dring the festival, and the pandemonium that ensued persuaded him that he had to do whatever it took to join the band. However he couldn't afford a train journey home to London, so he busked the festival ridden streets of Scotland's fair capital in a bid to raise money to get a train down to see us. He has a pretty beautiful voice so he got it pretty quick i reckon. And finally what's your London secret? Just for people to get their heads out of the north and east. They both rule but get west. See the lush greenery of Kew Gardens and Richmond Park, fall in love with an art student from Ealing and forever nurse a broken heart when she leaves you, pose in Knightsbridge, but see the hollow hole at the middle of it all, and drink real ale on the riverside in Chiswick and plan how you're going to spend your summer as planes criss cross across the sky travelling ever lonely onwards. Their debut album, Understanding Electricity, is out now, and they play the JD Set at the Luminaire on 15th May and most of the summers major festivals.